A new paper from Medraptors is just out now. It is the first systematic study on Honey Buzzard migration along the Balkans-Crete-Libya flyway. The results of this research show that individuals breeding in Greece migrate through the island of Antikhytira in autumn but not during spring migration. In the paper, two different hypothesis are discussed, both suggest a loop migration strategy as an explanation of their migratory behaviour. To download it click on the link below. Agostini N., Lucia G., Mellone U., Panuccio M., Von Hardenberg J., Evangelidis A. & Kominos T. 2012. 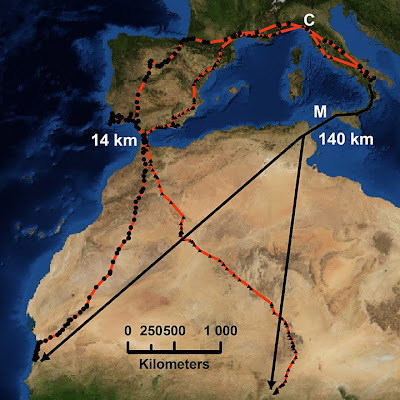 Loop migration of adult European Honey Buzzards (Pernis apivorus, Linnaeus, 1758) through the Central-Eastern Mediterranean. Italian Journal of Zoology DOI: 10.1080/11250003.2011.623245. On the photographic blog of Michele Panuccio a report on the autumn migration at Batumi, Georgia, has been posted. The pictures show aspects of raptor migration and human threats (poaching and trapping). To see it click on the picture below. Last September there was the sixteenth Italian Congress of Ornithology. Medraptors was present with two posters that can be downloaded from the link below. 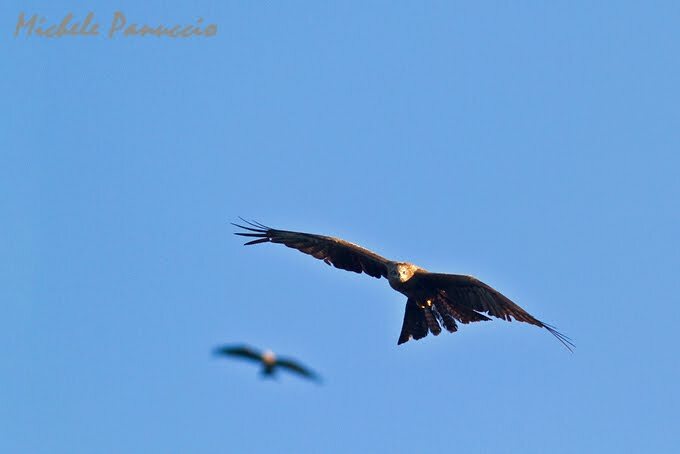 The first showed the results of a research on raptors wintering in Basilicata (Southern Italy) and the other one reported information on migrating raptors on Mount Olympus (Northern Greece). Both are in press on the volume of conference proceedings. Panuccio M., Agostini N. & Bogliani G. 2011. 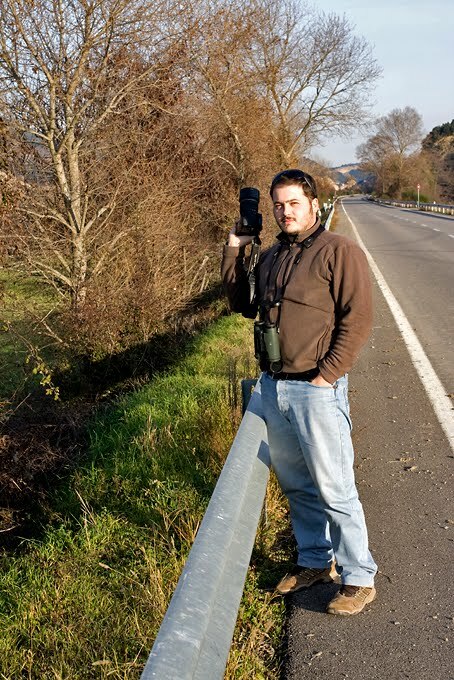 Mount-Olympus: a new raptor migration bottle-neck in northern Greece. XVI Italian Ornithological Congress, Cervia September 2011. Lucia G., Panuccio M., Agostini N. & Bogliani G. 2011. A two-year study of wintering raptors in Basilicata (southern Italy). 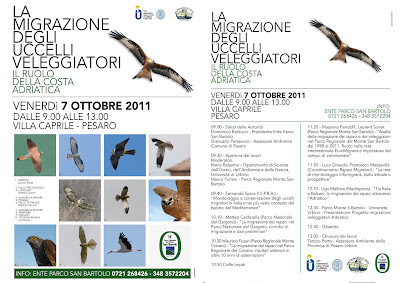 XVI Italian Ornithological Congress, Cervia September 2011. November 2011. Populations of migratory species can be affected by events occurring in distant and different parts of the world, and a bulk of studies suggest that long-distance migratory birds are declining at a faster rate than other species. Unfortunately, our knowledge of the ecology of migratory birds has been constrained by the difficulties in tracking individuals across seasons. Nevertheless, advances in the miniaturization of satellite tracking devices are now making it possible to determine the connections between the different seasonal grounds of birds in a way unimaginable few years ago. Moreover, the availability of fine-scale digitalized land use and climate maps obtained through remote sensing allow biologists to analyze the habitat preferences of those birds and model their distribution. The research group of the Estacion Biologica Terra Natura (University of Alicante, Spain) recently published the first papers dealing with habitat use of European satellite-tracked raptors wintering in Africa: the species involved are the Eleonora's falcon, that spent the winter in Madagascar, and the Montagu's harrier and the Egyptian vulture in the Sahel (West Africa). Eleonora's Falcons wintering in Madagascar selected degraded humid forests and cultivated areas close to pristine humid forest. They showed a preference for these land use types within areas where pristine humid forests were the most abundant habitat type. These falcons could be taking advantage from a spill-over edge effect of their insect prey into open areas close to humid forests. Therefore, the importance of humid forests for Eleonora's Falcons seems to be high. The current loss of this habitat in Madagascar is a cause for concern with respect to the conservation of this long-distance migratory falcon species. Montagu's harriers occupied a large region encompassing a total of eight countries. The most preferred habitats were croplands and grasslands. Protected areas only covered a small proportion of the overall wintering grounds of tracked harriers and the most suitable areas for the species in Western-Central Sahel. 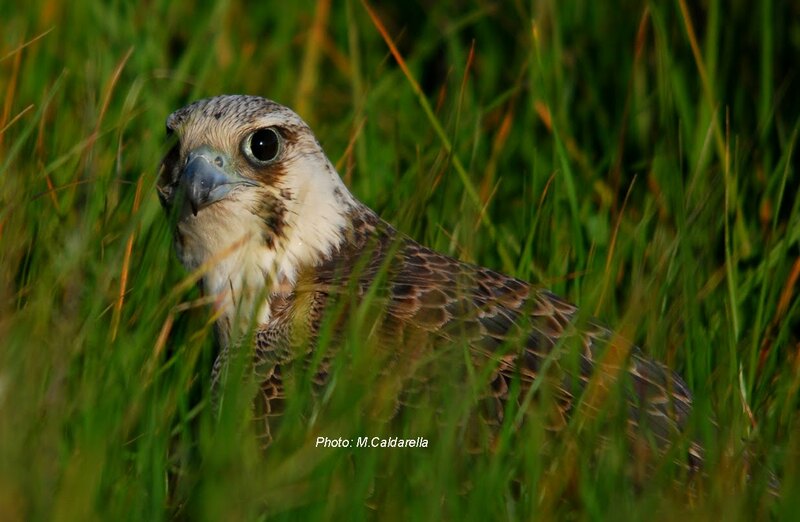 Increasing the extent of preferred natural habitats within protected areas should benefit the conservation of this and probably other insect-eating raptors. Conservation actions in the region should therefore be mostly focused on improving land use planning and management outside protected areas, specially enhancing agricultural practices to make biodiversity conservation compatible with poverty alleviation. Similar results were also recorded for the Egyptian vultures. The species winters in the transitional Sahelian eco-region which is composed of a mosaic of semi-arid grasslands, savannas, steppes, and thorn scrublands where traditional semi-nomad shepherds raise livestock in a system of transhumance, which is taken advantage of by Egyptian Vultures. Similarly to Montagu's harriers, these areas are located in southern Mauritania, along the Senegal border and in Central Sahel region. In all the three species, the individuals showed a high degree of site fidelity, occupying roughly the same areas in consecutive years. These data, coupled with other ongoing studies, will facilitate the conservation of these European long-distance migratory species also outside of their breeding range. Here following a nice picture (by Matteo Caldarella) of a beautiful, and unusual, young female of Peregrine Falcon of the calidus subspecies. 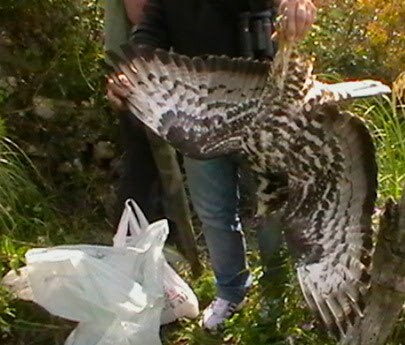 This bird was recovered with a slight fracture and happily released the past spring in Apulia (Southern Italy). To read more (in italian) click here. Mellone U., Limiñana, R., Mallìa E. & Urios V. 2011. Extremely detoured migration in an inexperienced bird: interplay of transport costs and social interactions. Journal of Avian Biology 42: 468-472. Last week there was a workshop organized by EUROMIGRANS Network. The associations taking part in the workshopv were: LPO (France), Fundacion Migres (Spain), BTO (Great Britain), Batumi Raptor Count, Medraptors and other organizations. Among the speakers also Keith Bildstein from the Hawkmountain Sanctuary, USA. Many participants from different countries: France, Italy, Spain, Belgium, Holland, Great Britain, Romania, Latvia. 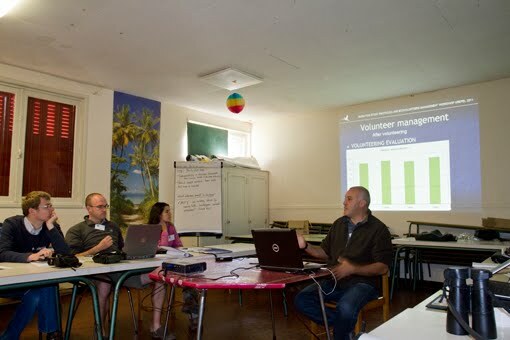 Topics covered during the workshop were the proposal to use a common protocol for counts of migrants in Europe and management of eco-volunteers. At the end there was a panel on the future of EUROMIGRANS and many proposals were made and soon a new website of this international network will be available online. The workshop was held in the picturesque setting of the Pyrenees Atlantiques and the organization was excellent thanks to the efforts of the coordinator, Jean-Paul Urcun (LPO-Lindus). 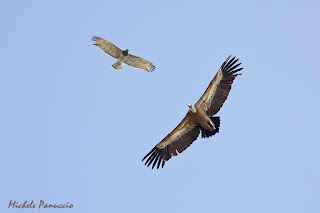 Although most of the time was spent inside the building where the workshop sessions were held, there was the chance to see many raptors, among them Red Kites and Griffon Vultures. Here following some pictures from the meeting. 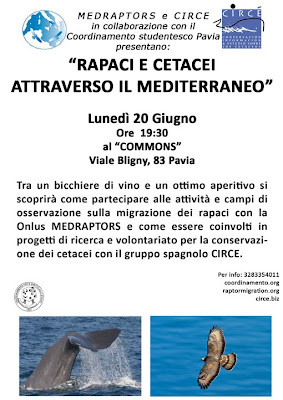 Here following the flyer of a meeting on the role of the Adriatic coast of Italy in relation to the migration of raptors. Medraptors will be there with a presentation on this topic. Il prossimo 7 ottobre si terrà a Villa Caprile, vicino Pesaro, un incontro sulla migrazione dei rapaci lungo la costa Adriatica italiana. 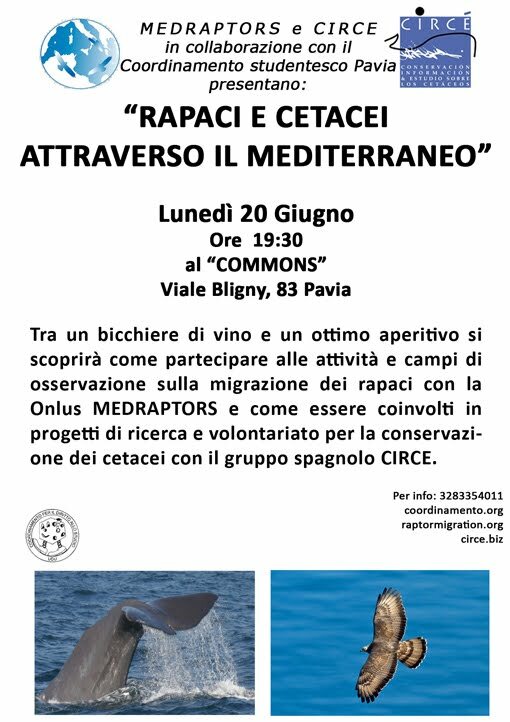 Medraptors sarà presente con un intervento che farà il punto sullo stato delle conoscenze attuali sull'argomento. Siete tutte e tutti invitati/e a partecipare. 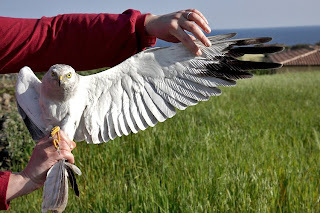 In the last two days at Batumi has been observed the migration peak of different species of raptors. Yesterday tens of thousands Steppe Buzzards and about 2000 Lesser-spotted Eagles have passed over the watchpoints together with some Steppe Eagles, Greater-spotted Eagles and Imperial Eagles. Really an impressive migration well monitored by the skilled team of Batumi Raptor Count! 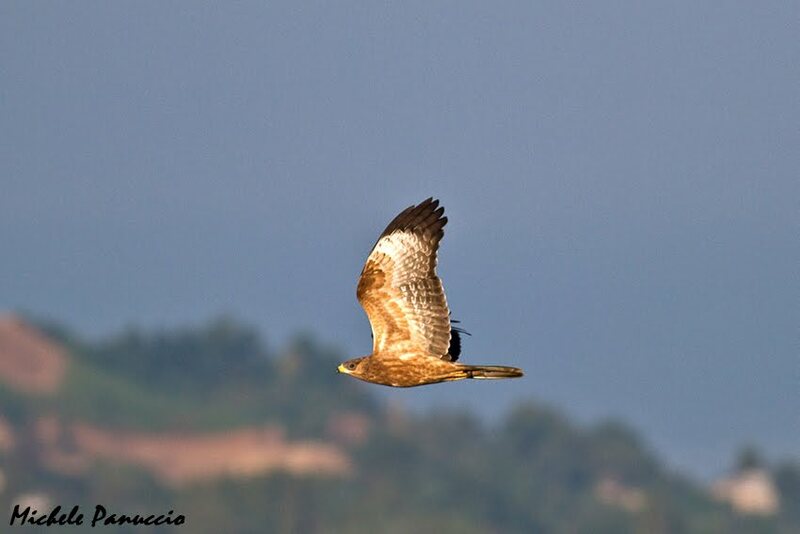 On the other hand in Southern Italy the peak of the migration of Marsh Harriers has been observed yesterday at the Aspromonte National Park where about one thousands of individuals has been counted. 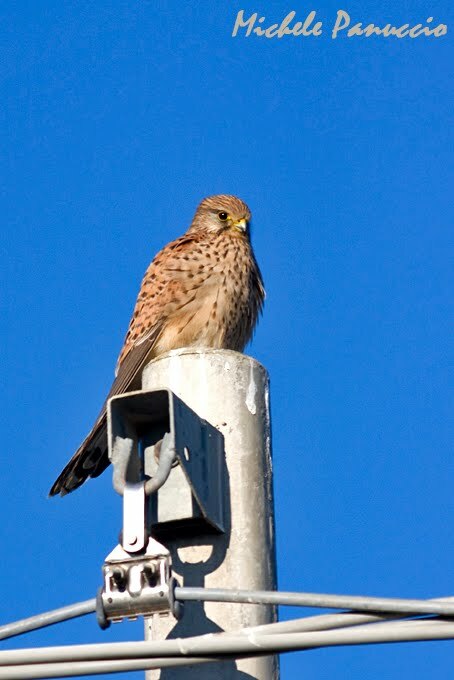 In these days many thousands of different species of raptors have been observed at Batumi (Georgia). Among others, Honey Buzzards, Black kites, Levant Sparrowhawks, Steppe Buzzards., Montagu's Harriers, Pallid Harriers, Egyptian Vultures. 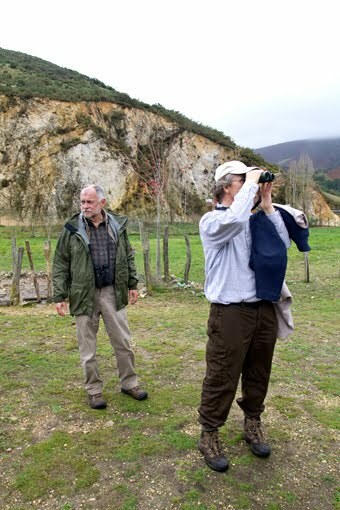 The Camp is led by Batumi Raptor Count who invited members of MEDRAPTORS. There are about 20 volunteers making observations from Holland, Belgium, Georgia, France, United States, Germany, Armenia and Italy of course. 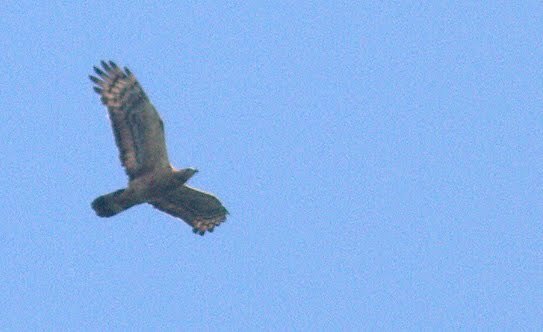 Here below a picture made yesterday in Batumi to Crested Honey Buzzard that is really a rare sight in the Western Paleartic area. A new project is starting! This week starts the project at Batumi that we are running together with Batumi Raptor Count. 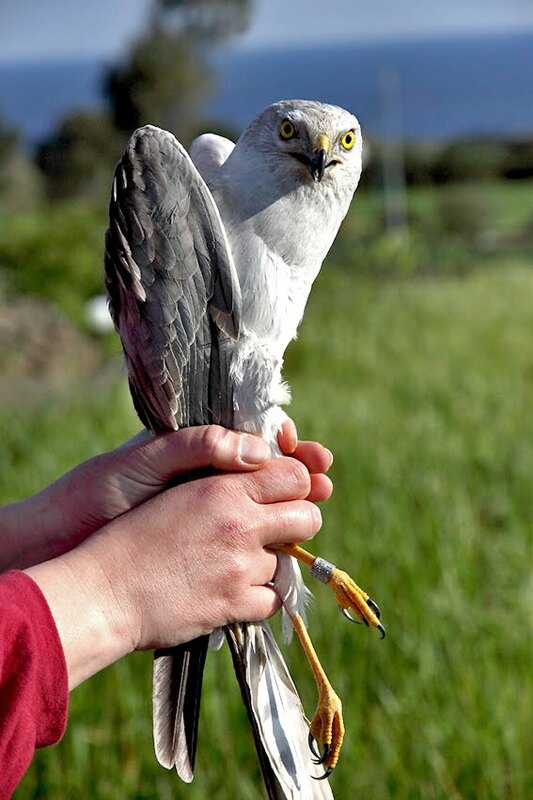 The project is focused on the influence of local weather conditions on the migratory behaviour of raptors. 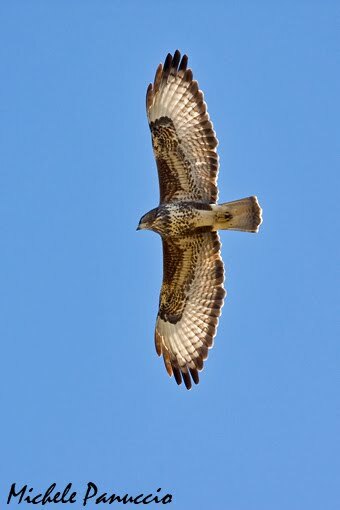 In this period the commonost species are: Steppe Buzzard, Black Kite and Lesser-spotted Eagle. 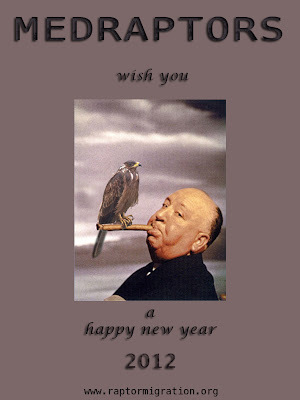 Click on the picture below to enter the website of Batumi Raptor Count. During the Camp on the Calabrian Appennines we have found a new watchpoint to monitor the migration of raptors along the chain mountain of southern Italy. 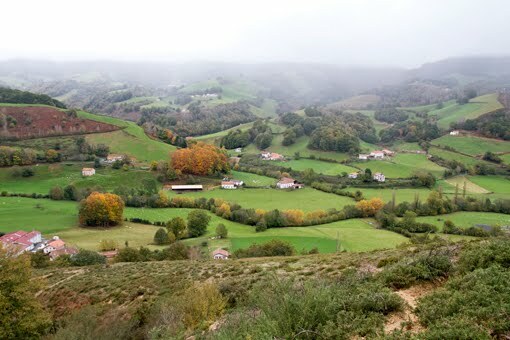 The area is located in the northern part of Aspromonte close to the border of Serre Mountains. 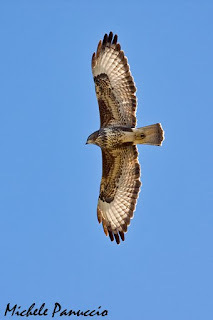 Interesting numbers of Honey Buzzards have been recorded. 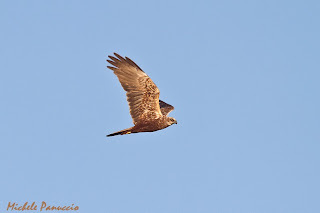 Moreover we observed the following species of migrating raptors: Black kite, Marsh Harrier, Montagu's Harrier, Hobby, Eleonora's falcon, Kestrel. 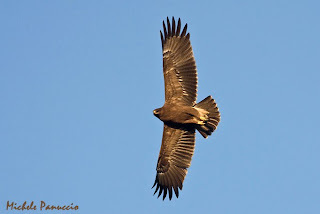 Among resident raptors the Goshawk, the Honey Buzzard and the Bonelli's Eagle. Further investigations are needed to quantify the migratory flow at the site. 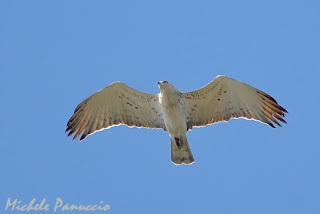 Click on the picture below to read a new paper concerning the summering of immature Short-toed Snake Eagles in northern Africa. Stop the massacre of migrating birds! 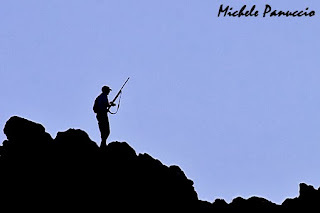 Two different episodes concerning poaching against migrating birds in the Mediterranean. The first one is a severe aggression against two Italian volunteers who were conducting anti-poaching activities in Cyprus. At the end of April they have been kidnapped and beaten by Cypriot poachers. The police arrived on the scene but did not denounces the attackers. The second episode thankfully is good news. 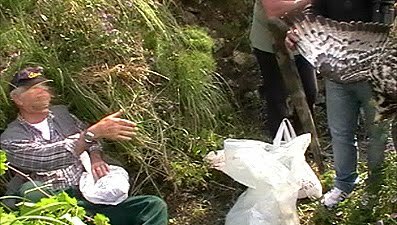 Here below some pictures of an action made by LIPU (BirdLife Italy) volunteers and by the anti-poaching group of the italian forest rangers (CFS - Ministry of Agriculture and Forestry) the 26 of May at the continental side of the Strait of Messina (Southern Italy). The intervention led to the arrest of a 63 years old poacher from Reggio Calabria. He had an illegal weapon (12 caliber rifle with serial abraded) that was seized together with hundreds of cartridges for hunting raptors in the area "Water Pigs" near Scilla town. Poachers used to reach that place by a long rope tied to a tree. During house search were seized 5 other rifles , six thousand cartridges and 15 pounds of gunpowder. Congratulation to the LIPU volunteers and to the forest rangers for their good work. We express our indignation over the episode in Cyprus and solidarity to CABS (Commitee Against Bird Slaughter) volunteers. We wish that illegal hunting will stop in Italy, Cyprus and in the whole Mediterranean area. 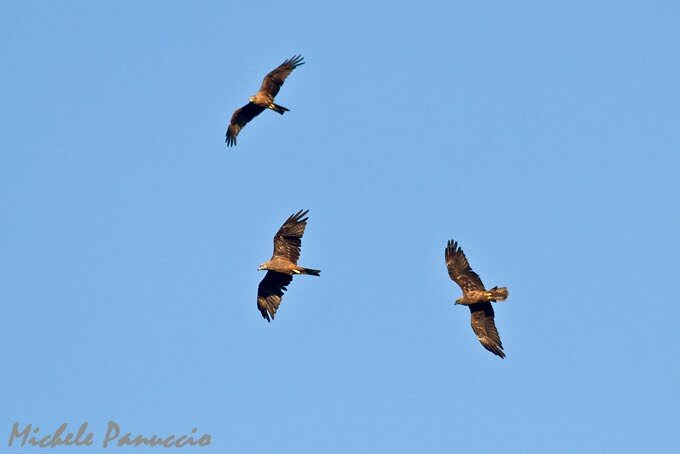 Between the end of August and the beginning of September there is the peak of the migration of different species of raptors in the Central Mediterranean area. In particular thousands of Honey Buzzards and Black Kites follow the italian peninsula concentrating along the Calabrian Appennines. Other species observed in smaller numbers in this period are: Marsh Harriers, Montagu's Harriers, Ospreys, Booted Eagles, Common Buzzards, Ketrels, Lesser Kestrels. 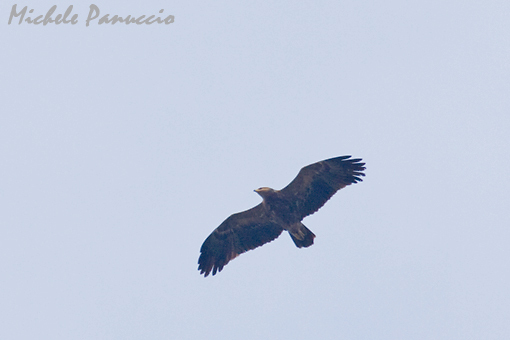 Sometimes with some luck it is possible to watch rare raptors like the Egyptian Vulture or the Lanner Falcon. This year the aim of the camp is to localize the migrating corridors of raptors between two mountain ranges: the Aspromonte and Serre mountain chains. In this point the italian peninsula is only few tens of chilometers wide. The study area is covered by forests and it is included in the Aspromonte National Park, while the seaside is few chilometres far. 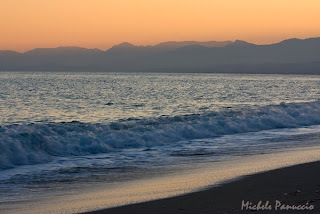 The wonderful so called "Jasmin Coast". The watchpoints are located at altitudes of 800-900 m a.s.l. on hilltops and mountain ridges. If you are a fan of birds of prey join us, we are looking for volunteers. Download the application form from our website. Siete tutti e tutte invitati/e a partecipare! After 42 years Osprey is back in Italy! This is really a good piece of news, since the last breeding pairs were recorded in Italy in the '60s. Now a pair is feeding two chicks on the coast of Tuscany, central Italy. 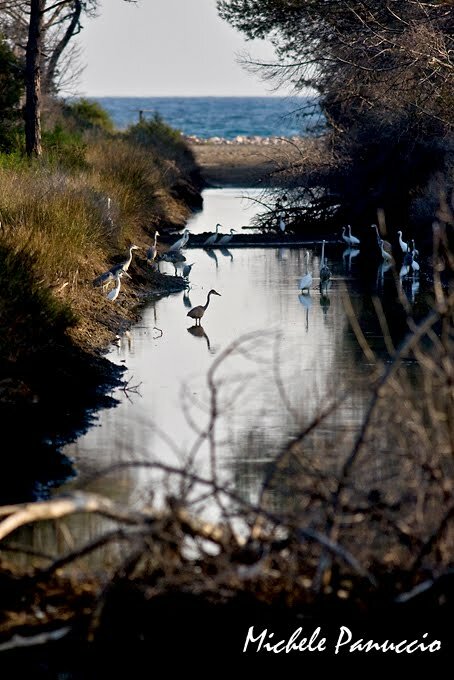 This is a good result that rewards conservation efforts of the Maremma Regional Park. 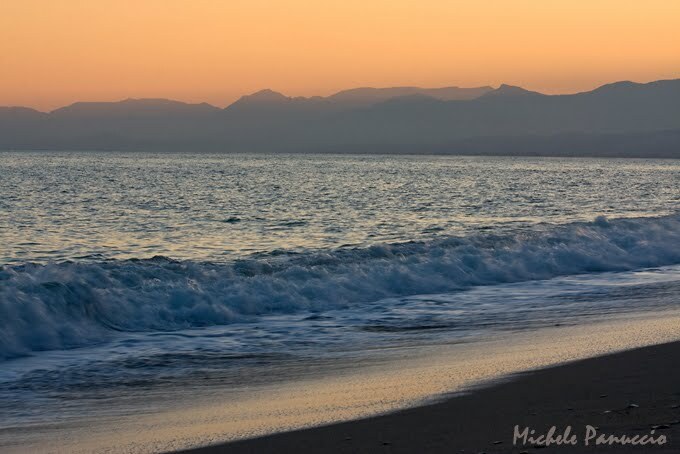 The Mediterranean population consist of only 100 pairs located in Corsica, Balearic islands, Algeria and Morocco. Now we hope that they constitute a stable population in Italy. 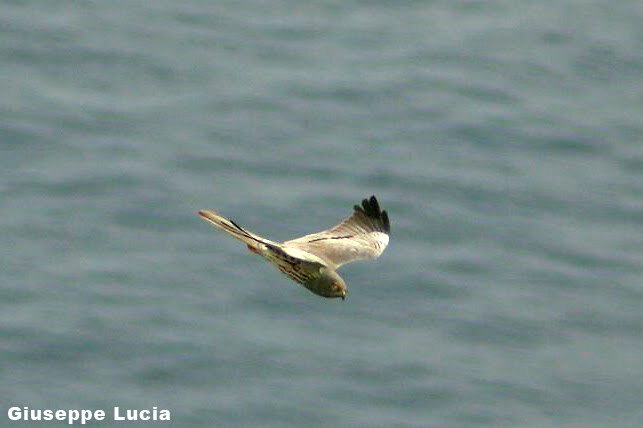 Our friend Giuditta Corno sent us two pictures of a beautiful adult male of Pallid Harrier ringed at the island of Ustica at the end of April. 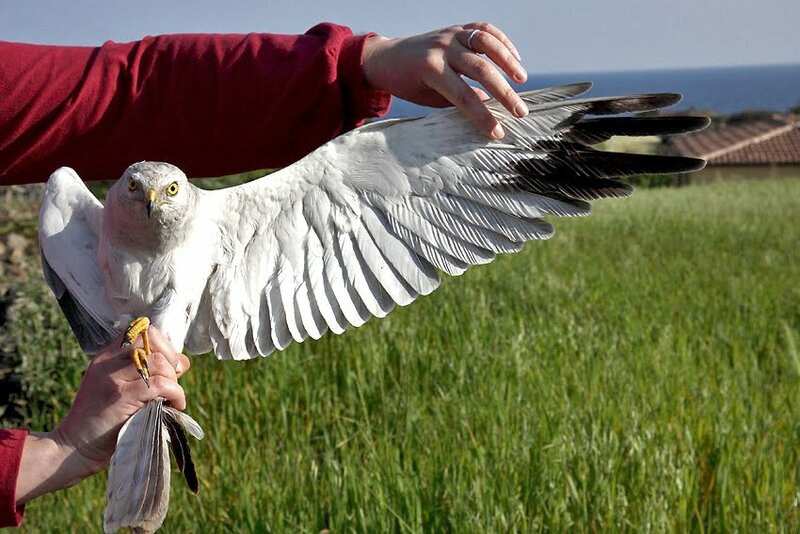 At that island we counted up to 44 migrating Pallid Harriers during spring 2002, while the ringing monitoring at Ustica is made by the Palermo ringing station and coordinated by ISPRA. On the photographic blog of Michele Panuccio a report on spring migration at the Strait of Gibraltar and at the island of Panarea has been posted. To see it click on the picture below. A new Medraptors paper is out now on the current issue of British Birds. 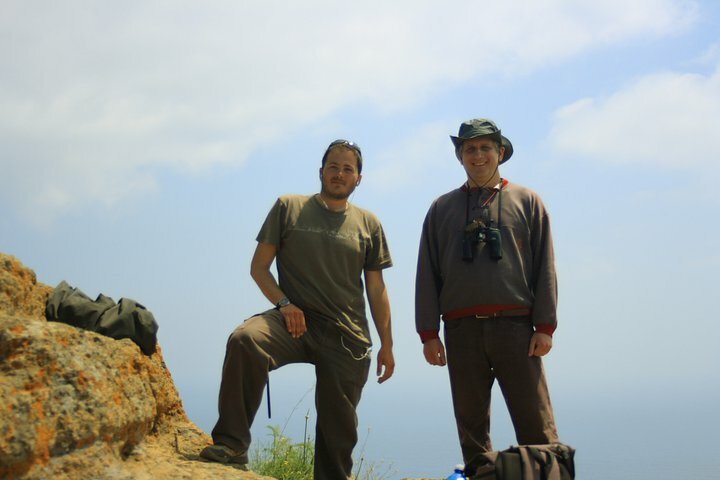 The paper shows the results of the first systematic survey made in Greece on raptor migration. There are analyzed data collected during five fieldwork seasons carried out between spring 2007 and autumn 2009. Lucia G., Agostini N., Panuccio M., Mellone U., Chiatante G., Tarini D. & Evangelidis A. 2011. 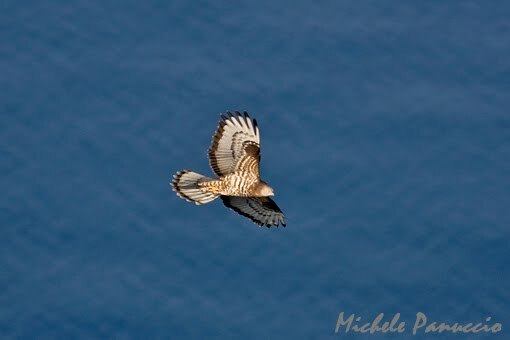 Raptor migration at Antikythira, in southern Greece. British Birds 104: 266-270. 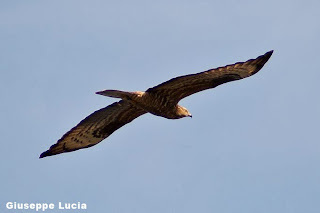 After two days of bad weather and strong wind, today 120 and 100 Honey Buzzards were observed migrating respectively at the islands of Panarea and Ustica. In the pictures below an Honey Buzzard and two ornithologists in action at Ustica. 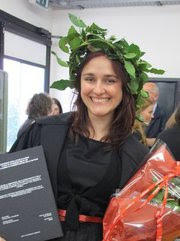 Some days ago two students graduated and they discussed their theses made within MEDRAPTORS research projects respectively at the Universities of Pavia and Parma. The first thesis concerns autumn migration at Antikythira in relation to weather conditions while the second investigated the migration and wintering of Marsh and Montagu's Harriers through the analisys of ringing recoveries data provided by EURING. Diego Tarini - Migrando di isola in isola. Analisi del passaggio autunnale dei rapaci e dell'influenza delle condizioni meteorologiche nella Grecia meridionale [An island hopping migration. Analysis of the southbound passage in relation to weather conditions in Southern Greece]. Università degli Studi di Pavia a.a. 2009/2010. Lisa Muner - Analisi della migrazione, dello svernamento e della dispersione del Falco di Palude (Circus aeruginosus) e dell'Albanella Minore (Circus pygargus) tra l'Europa e l'Africa [Analysis of the migration, wintering and post-reproductive dispersion of Marsh and Montagu's Harriers between Europe and Africa]. Università degli Studi di Parma a.a. 2009/2010. 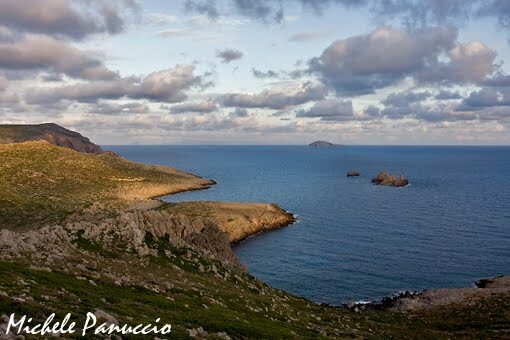 Yesterday more than 3500 Honey Buzzards were observed migrating northwards at Panarea, in the Aeolian Isles while 200 passed by Ustica. In the previous days few birds were observed in both sites. At panarea in particular the more common scene observed was the hunting activity of Marsh harrier and Common buzzard on rats that are very common at this site! Two bad news for birds that are migrating through Italy. The first one concerns a seriour act of intimidation against the ringing station of the island of Lampedusa where poachers destroyed the ringing station and set fire to a car because they would like poaching without any witness. 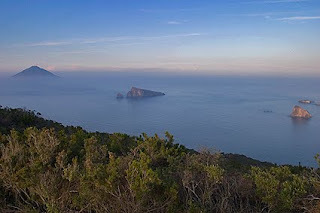 The ringing monitoring at that island is made by the Palermo ringing station and is coordinated by Ispra within the "Small Island" project started in 1988. Moreover the other bad news concerns the situation at the Strait of Messina where for the first time after several years the Italian government is refusing to send the anti-poaching task force. At that site, last year poachers killed 400 hundreds Honey Buzzards in the area close to the city of Reggio Calabria. This decision could cause a massacre of migratory birds frustrating the results obtained in more than 20 years of protectionist activities. 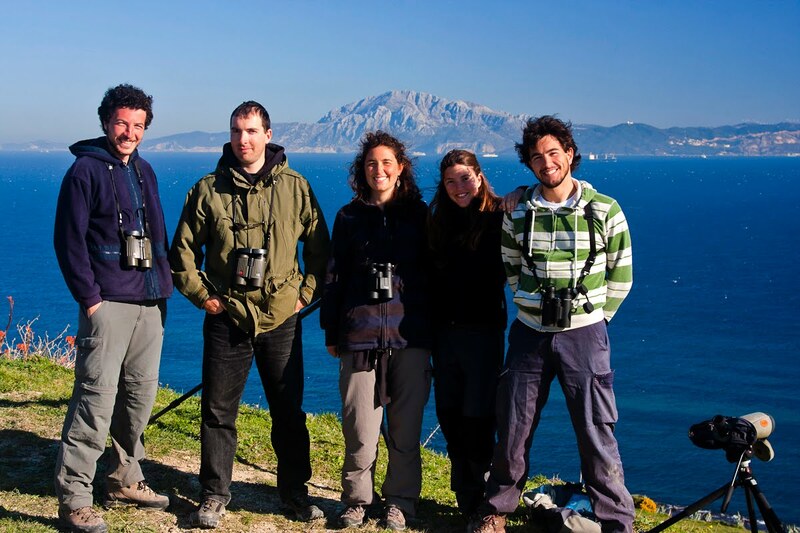 We send our solidarity to the Sicilian ornithologists active in Lampedusa island and we express our disapproval for the government choices. From Ustica a nice action shot of a mobbing scene. The Migratory Raptor Project that we are running together with LIPU - BirdLife Italy started on the 20th of April. Up to now some tens of raptors passed at the island of Ustica, most of them were Marsh and Montagu's Harriers, Hobby Falcons, Red-footed Falcons and last night a flock of Honey Buzzards roosted on the island. Among other birds Grey Herons, Little Egrets, Shags, Bee-eaters, Alpine Swits and a flock of 16 Golden Orioles migrated at the site. 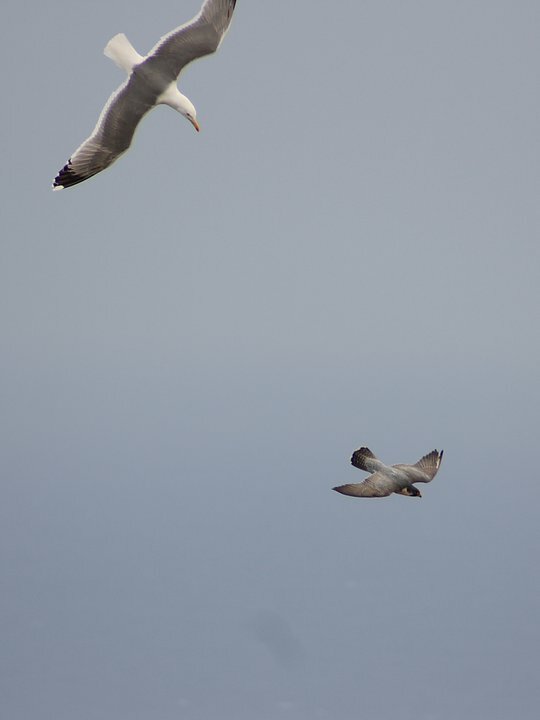 Last week-end was great for migration at the Strait of Gibraltar. 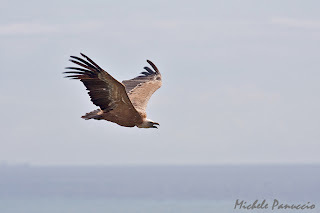 Hundreds of Booted Eagles, White Storks and a lot of Black Kites crossed the Strait coming from Africa. 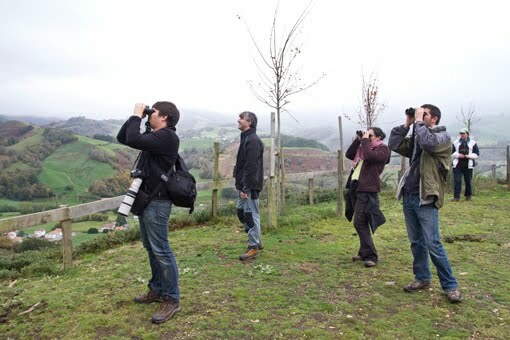 The migration is always monitored by ornithologists of Fundaciòn Migres. 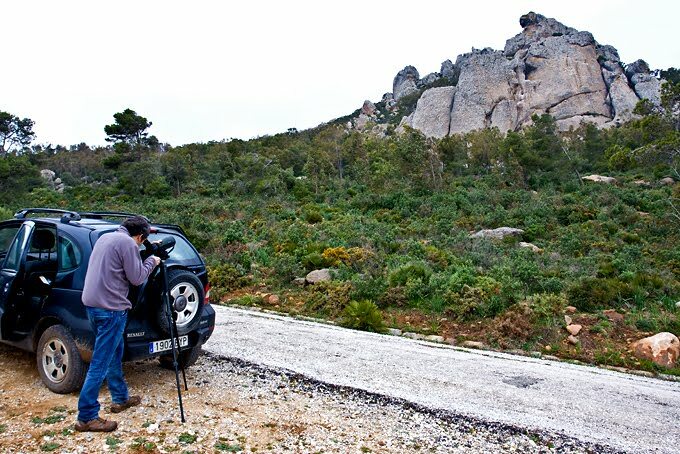 Here below a picture of a Griffon Vulture in the same thermal with a Short-toed Snake Eagle and two pictures of the researchers, among whom Keith Bildstein from Hawk Mountain Sanctuary. Between the last decade of August and the first week of September we will make a fieldwork in Southern continental Italy at a new potential bottleneck site along the Calabrian Appennines. The site is a beautyful mountain area mainly covered by forests enclosed in the Aspromonte National Park and the seaside is not far from there. In fact the peninsula in that point is wide few tens of Kilometers. In that period the commonest species are: the European Honey Buzzard and the Black Kite. We are looking for volunteers, if you want to join the camp contact us. Yesterday a pair of Egyptian Vultures was already in the nest in Cádiz Province, Spain. However in these days many individuals of this species are still migrating from Africa to Europe. In the picture below Antonio-Román Muñoz of Migres Foundation monitoring cliffs nesting raptors in Andalusia (southern Spain). The aims of this Foundation include different kind of activities: researches on migrating raptors and ecology, monitoring raptor population, wildlife management, popularization and educational programs (see their website: www.fundacionmigres.org). 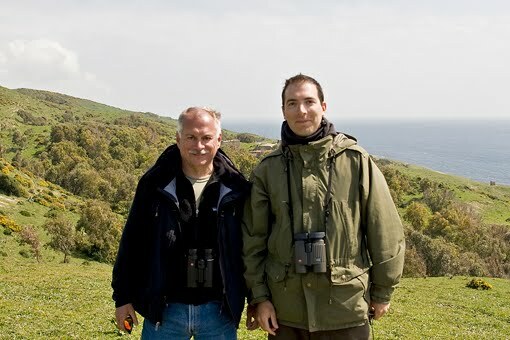 In autumn 2011 we are going to run a field work at Batumi in cooperation with BRC. We will collect data on the flight behavior of the most numerous species of soaring birds during a period of three weeks between the half of September and early October. 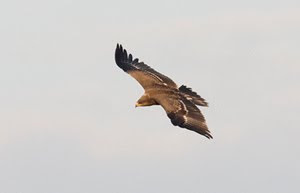 The most important species will be Steppe buzzard, Lesser-spotted eagle, Booted eagle and Black kite. In particular our aim is to collect data on the flight altitude in relation to atmospherical conditions. As such the study aims to improve our understanding of the efficiency with which soaring birds migrate under differing weather conditions and how this affects local route choice in the bottleneck. 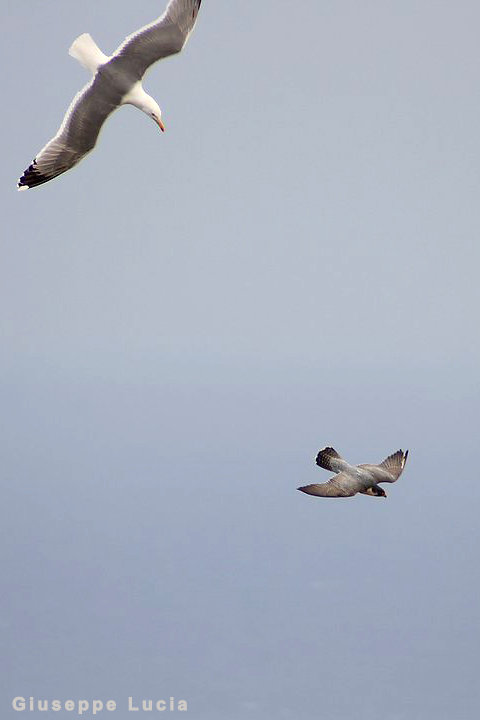 Studies on flight behavior in function of weather are crucial for a migration monitoring project. Because counts can be subject to large variability due to weather conditions. It is (among other issues) crucial to show that a watch-site like Batumi covers a majority of the seasonal migratory flow. This research will be an important early step in getting to understand local migration dynamics of different species. Batumi Raptor Count is a very important project for the protection of European Raptors. At this site a huge number of raptors migrate during autumn mostly coming from the formerly Soviet Union. 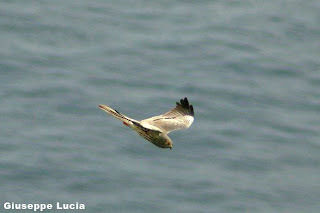 In 2009 more than 800.000 raptors were observed migrating on the eastern coast of Black Sea. A long term monitoring could provide informations of paramount importance for the protection of European birds of prey. For this reason we are proud to cooperate with the researchers involved in Batumi Raptor Count (click here to visit BRC website). On the photographic blog of Michele Panuccio a report on autumn migration at Bosphorus has been posted. To see it click on the picture below. 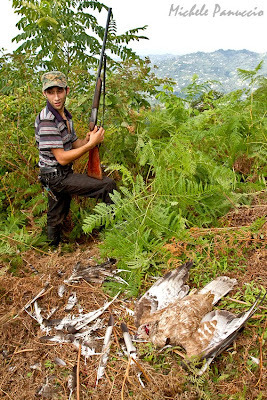 Unfortunately in Italy there are about 700.000 hunters in Italy, that represent a huge impact on environment in some areas . Differently from other European Union countries, in Italy hunting - concerning species and dates - is increasing thank to the lobby activity of weapon industry and hunters associations. We finished the winter raptors monitoring in Basilicata (Southern Italy) after more than 400 km of car transects. We counted about one raptor per km. Mostly Common Buzzards, Kestrels and an impressive number of Red Kites. We observed also some Northern Harriers (more than expected), Sparrowhawks, Black Kites, Marsh Harriers and one Osprey. 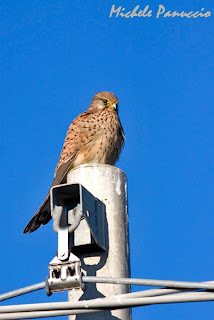 In the pictures below, a perched Kestrel and a typical road counter during a break.